Our quality is the result of 50 years of research, expertise and steadfast commitment. At a young age, Mauro and Moravio Antonelli began their working lives as turners in a small workshop. This was in the legendary 1960s, the era of the big dream, enthusiasm and general prosperity, accompanied by a mass cultural change. In Italy this intense development phase became known as the "Economic Boom". During that period Antonelli M&C grew strong and solid, developing its own production brand in the area from Cascina as far as Pontedera and Pisa. Of Roman origin, Cascina has a flourishing carpentry tradition with numerous furniture factories, and the jewel in the crown in that era was the Art Academy, which included carpentry in its curriculum. Since the 1960s this Pisan town's resources of carpenters, designers, architects and furniture manufacturers have made it synonymous with quality and perfection. 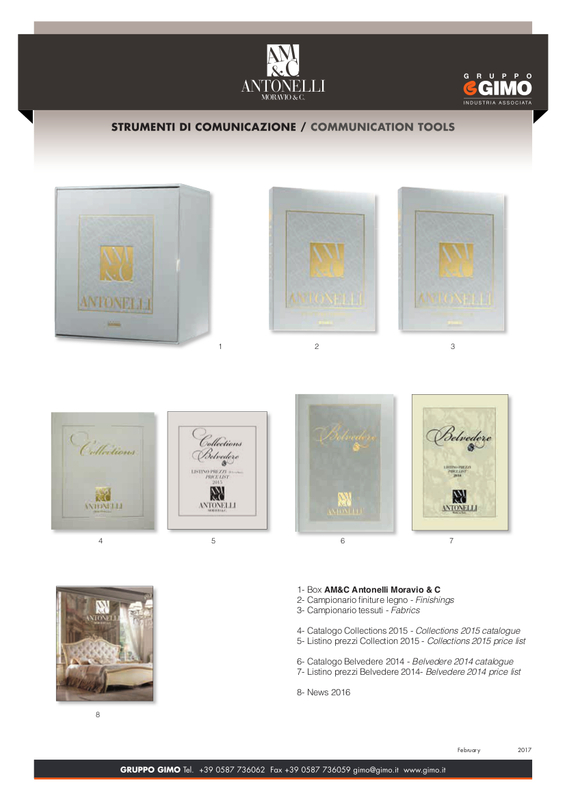 From its origins to our day, Antonelli M&C has followed a long, intensive path in the furniture sector, constantly developing its production know-how, obtaining and maturing its own business expertise which continues to be the guiding light for the company's prosperity. In the meantime the company's furniture production expanded its horizons, from the initial wholesale furniture and accessories for entrance halls to complete collections to furnish every room in the home with specific, customised pieces distinguished for their strong design. Many things have changed since business began, but the capacity to step forward in line with market trends, constantly challenging new horizons, has gradually increased its strength on the Italian and International markets. Today, in the new company headquarters built in 2004, the later generations have found their true position as business owners with far-sighted goals to be developed, ever ready to face new economic challenges. Una ricerca attenta dal punto di vista ecologico, permette di limitare o eliminare sostanze tossiche per un evidente vantaggio dell'ambiente. Il rispetto dell'ambiente e la salvaguardia del patrimonio naturale è un principio fondamentale per Antonelli M&C, per questo sono state fatte delle scelte aziendali che operano in questa direzione, monitorando e riducendo qualsiasi forma o metodo in grado di danneggiare l'ambiente. Alcuni impegni di cui la ditta si fa carico sono il recupero dei rifiuti, la tutela delle acque e la riduzione di fumi tossici nell'atmosfera. Tutto questo rappresenta un enorme impegno aziendale con esecuzione di procedimenti a norma e certificati per ottenere non soltanto mobili dalle forme stilistiche perfette ma anche corrispondenti ad un valore morale di qualità e di sicurezza dal punto di vista salutistico.